Hi everyone, this is our weekly update on GRAFT development activities. GRAFT developers are currently launching RTA Public Alpha, which is targeted for November 12th, 2018, while preparing to start working on RTA Beta. We would like to thank our community, and especially the alpha test group, for their continuous feedback, finding issues, and suggesting solutions – you guys ROCK!! Last week GRAFT network was successfully updated (“hard forked”) with a new version of GRAFT software that introduced a new variation of the PoW hash algorithm which prevents ASIC mining. The major network update has applied a new variation of CryptoNight hash algorithm (CN variant 2) which is currently ASIC-resistant. The major network update (aka hard fork) in GRAFT mainnet was triggered on Wednesday, October 31st at block 207,700. As a reminder, major network update means that if you are running a GRAFT network node (graftnoded) you must upgrade to the latest software. If you haven’t done it yet, please do it ASAP, otherwise your node will be either disabled or connected to the wrong chain. Note that users of GRAFT mobile and desktop wallets are not affected by the hard fork and should not do anything. 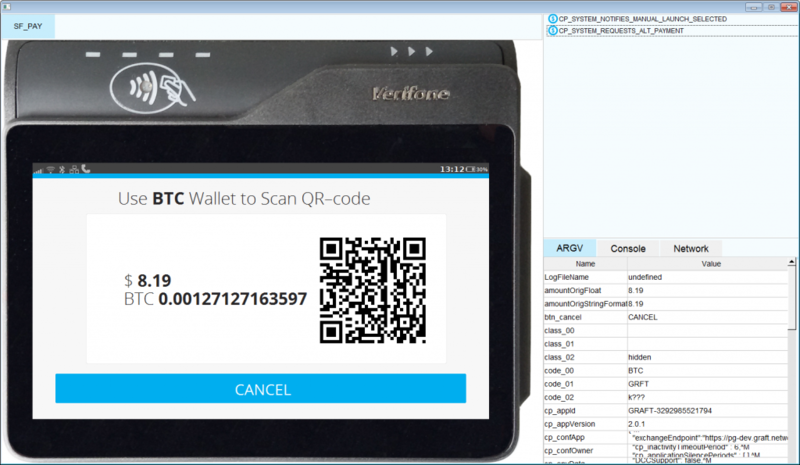 Please see below the screenshots of the new Verifone terminal app UI. 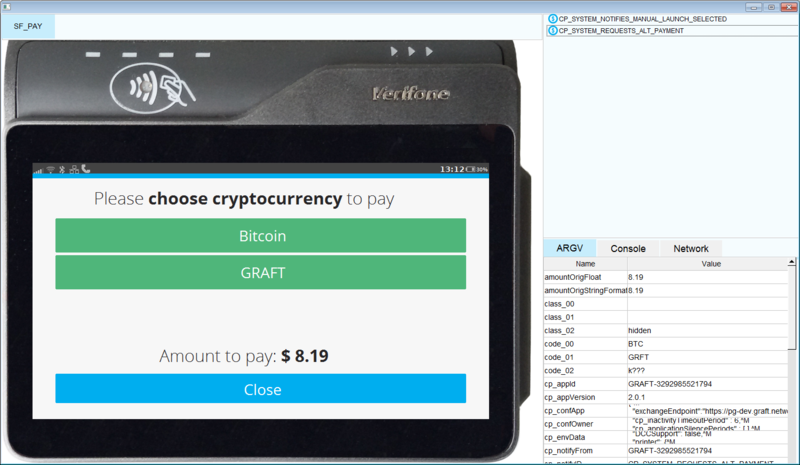 The new UI, remastered for accepting payments in multiple cryptocurrencies, is being tested now before submitting to Verifone for recertification. Currently, both GRFT and BTC are supported on GRAFT and Bitcoin mainnets, with more altcoins coming very soon. Finally, some in the community have expressed concerns about the issues they identified that are not getting addressed in a timely manner or being “ignored”. We would like to assure you that we take all the comments and pull requests very seriously. 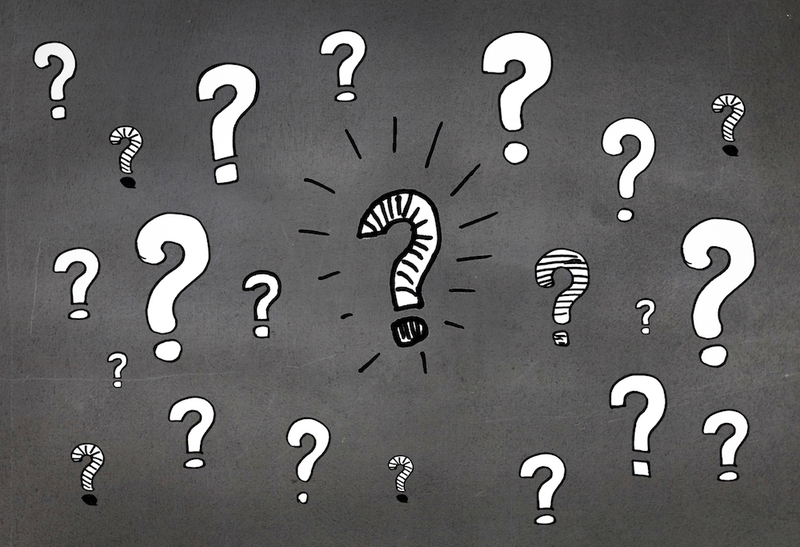 The timing of when those get addressed has to align with our development timeline though as each request has to be carefully evaluated, integrated, and set up for proper testing. In terms of the team’s skill set, we want to assure everyone that we have one of the most capable teams we’ve ever had the privilege of working with over our longish careers. We have over 150 years of combined experience and education in the field among us and multiple PhD’s and professional certifications on the team. We have built very robust and secure systems at the core of Cisco, Sonicwall, NCR, and HP in the past. We study relentlessly and leverage the best known methods in the field and the latest research being done out of MIT and Stanford. We take this project very seriously and pour our heart and soul into it, using everything we know, but most importantly – leveraging what already works. Payment-processing blockchain is not the place for wild experimentation. With that said, we look forward to more pull requests in the spirit of a real community open source project. Looking forward to another exciting week and Happy GRAFTing!